Death of a Minor TV Celebrity Album reviews. Well . . . do you? Thats all you have to ask yourself. 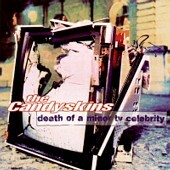 The success of Oasis has produced many sound-alikes, The Candyskins being one of the best of them. But dont think this means The Candyskins are a completely unoriginal band with no sense of identity. There are points within their new album, Death of a Minor TV Celebrity, that they achieve a sense of themselves. Take, for example, the name of the album. Its creative. . . that would be a start, right? Okay, maybe thats a bit harsh. This probably stems from my unbridled hate for Oasis (please dont throw anything at me or send me hate mail, all you die-hard groupies) and I cant stand unoriginality (can anyone tell the difference between the song "All For You" by Sister Hazel and any Blues Traveler song? Seriously). So many Brit-pop bands fall into this rut. But there is light at the end of this tunnel. Remember Radioheads Pablo Honey? They broke out of their "Pixie sound-alike" rut and have achieved sounds beyond anyones wildest dreams. See? If fellow Oxfordite Thom Yorke and the crew can. . .
"Death of a Minor TV Celebrity" is a very promising ballad, and probably one of the most promising tracks on the album. The vocals are appropriately reminiscent of Oasis (not a blatant copy), and the back-up piano work is beautiful and flowing. An Oasis fan, I mean? My advice? Watch for the Candyskins in the future. They plan to tour the US soon, and the live shows are supposed to be their forte. Their present work looks very promising, so any future albums will certainly be welcome. Hey, who knows how long Oasis is going to last?